You may possibly recall I emailed you last Summer, 2015. I had p/xed my one owner, 2004 reg, FIAT Barchetta, against a Ssangyong Tivoli. The Tivoli gearbox was giving me problems. Ssangyong replaced the gearbox; my problems persisted. They agreed to swap the Tivoli for a new automatic model. I gained by the reg letter change, so have a Sept 15 plate, and I paid an additional £1,000. The Tivoli is now okay, but I don't love it. I have never regretted selling a car more than my FIAT Barchetta. It was my 2nd Barchetta, having owned one for 7 years previous to the one I p/xed last Summer. (So, 18 years in a row of Barchetta ownership). At the Tivoli’s first service in September I asked the dealership if they would buy the Tivoli back from me, for cash. They said they might, but in November, as they had lots of p/xs at the time. I phoned them at the beginning of this month, and they decided not to buy mine back, as they still had too many on their forecourt. Fair enough; my problem, not theirs. I was attracted to the SUV styling of the Tivoli, but I now find that it has dated very quickly, and is not necessary for my driving needs. I do not do many miles each year. It is a second car in our household. I need to swap the Tivoli with something that gives me the excitement of the Barchetta. 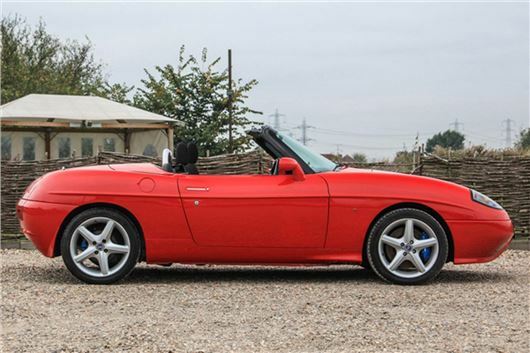 I loved the fact the Barchetta was LHD, was convertible, was Broom Yellow, had amazing pop out door handles; I only ever saw another Barchetta on the road twice a year, was very reliable, and cheap to run. What should I swap the Tivoli for? I suppose another Barchetta, but mine was one owner, garaged every day, FSH, and was immaculate. Any "out of the box ideas"? I received this on 26th November and told AN there was Barchetta in Historics auction that day at Mercedes Benz World, Brooklands. The Historics Barchetta had been fitted with a new 2.0 litre Alfa TwinSpark engine and converted to RHD. It sold for just £2,128 including auction commission. AN missed an amazing bargain. Even I should have bought it, if I had anywhere to put it. You have for some time advocated Shell V-Power Nitro Plus fuel as being better in terms of overall consumption. In Epsom we were paying 115.9 for ‘premium’ unleaded but the higher octane petrol is 130.9. What is your price differential to make a decision to take the premium fuel? I think I prefer Tesco Momentum 99 octane for 118.9. The main reason is the additives that keep my fuel systems and EGRs clear of very expensive problems that would cost vastly more than the collective fuel price premium. Extra economy is a bonus that helps to repay the added cost of the fuel. My KIA cee’d diesel automatic is almost the perfect car. It definitely can be excluded from the Petrol v Diesel rule. It is far better than any of my previous 40 petrol engine cars. My first cee’d did 24,000 miles over 3 years at an overall average of 34mpg. 90% was Edgware into London and twice weekly to Watford. No Yellow warning light, unlike my previous Chevy Cruze. My second cee’d is now I year old and 9,000 miles (how time flies). Overall 40mpg with ISG switched off and driven fast, 7 days a week 2.2 mile each way journey, then mainly around Edgware and into central London. I have not been to Watford for the past six months. It needs your recommended Michelin Cross Climate tyres for steering feel and slightly better ride at 30PSI. No Warranty claims. Feels very much faster than the official 0 to 62 second figure. A very underrated car. From one of my most critical readers, that is high praise for KIA. But I don't get many complaints about KIAs generally. Certainly nothing like the overwhelming level of problems with VAG vehicles. As an avid reader of your Saturday Column, I note that you regularly recommend to take action through the “Small Claims Track” of County Court. I would like to relay an incident that that has now been running for some 4 years. Having suffered lost of by a Fire at a third party site, the guilty party refused to provide insurance details so we went through the Small Claims Court process. We submitted the forms on line (can be easily conducted by the layman). We agreed to Arbitration, which was impressive, conducted by an independent very shrewd business woman. But ended up on our given day at Court. As encouraged by the Court, we accepted an offer of settlement just before going in to Court. Agreement drawn up (Tomlin Order to pay amount due ) and blessed by the Judge for payment to be made to us within 14 Days. We received a token £500 (one tenth of total) by cheque one week later but no further monies arrived. This is where we find ourselves today. The court said that they could do nothing, suggesting that we should take them back to Court. More outlay, no guaranteed outcome. We have no confidence that the offending party would adhere to any further ruling, having ignored this one. We have chased the funds, even sort advise of our MP, all to no avail. I hope that you can recommend a course of action. But also this may alert you to the failings of our legal system. It appears that only those who adhere to the rules have to stick to them. Well yes. It only works if operations, have assets and have a reputation to protect. But you are right that some businesses in trouble simply liquidate, leaving their creditors empty handed, then start up again. In your case the miscreant is in contempt of court and has a County Court Judgement made against him. You are entitled to contact a firm of bailiffs to enforce the order against the miscreant's assets but even that may not help when you are dealing the scum of the earth. We have a 5-year old Citroen DS4 with 18-inch wheels and 225/45 R18 tyres. My wife has a back problem and we have recently moved into Monmouth where the roads are in a bad way to say the least. I understand that reducing the wheel size and compensating with bigger tyres can produce a softer ride. Would this help? If so, what would be a good combination? I purchased a Polo S TDI 1.4 diesel in 2002 intending to use it for long journeys in retirement. However, medical problems have limited my driving and the car has only 41,000 miles on the odometer after 14 years. I have the car serviced by a private garage that has served me well. Should I sell the car now or keep it? If keeping, are there any parts that should be replaced or any other action that should be taken? This car precedes the universal fitting of emissions reducing equipment such as DPFs so no problem there. Does need fluids such as coolant and brake fluid changing at the next service, as well as the engine oil and filter. The 1.4TDI is belt cam so will need the timing belt, tensioner and waterpump all replacing if this has not been done within the past 4 years. I have a SEAT Leon 1.9TDI Leon with only 91,000 miles. I'm getting bored with it: too slow and windows keep steaming up. I've seen a 2007 Ford Focus 1.6 Climate with 99,000 miles. Looks very tidy. Should I keep the Leon, or get the Focus? Focus 1.6 petrol or Focus 1.6 diesel? Focus 1.6 diesel best avoided. The SEAT is steaming up because you've got a leak: Possibly rainwater coming in via the pollen filter because the rainroof cover is cracked or out of position; Possibly because the damp proof membranes between the doors and the door trims are perforated; Possibly because the door bottom drains are blocked. Rubbered up the wrong way? We finally settled on a Mazda CX-5 2.2 Skyactiv 175HP diesel with auto gearbox. It’s a 2013 model with only 40,000km on it. We’re picking it up today. Thanks for your help in choosing it. Just one further question, please: The owner is offering 4 x 19-inch winter tires too, at a cheaper price than buying new. However am not sure whether that's a good idea or worth getting 17-inch rims and tires for winter, both for security of winter driving plus the ongoing cost of remounting the tyres twice a year? They handle better on 19s, so. if he's offering them cheaply enough, buy them. Negotiate. Who else could he sell the tyres to? On my new VW Jetta I notice that the speed and rev displays will not light up on side lights. The dealer tells me this is across the whole range. Why? I have always found it a very useful feature. You're not supposed to drive on side lights. They are for parking only. That's why. But if the speedometer cannot be read without being back lit then that is a fundamental fault of the car and one you can demand the dealer corrects. I'm considering a change of car and thinking about the SAAB 9-3 1.9 TTiD. I had a SAAB 9-3 previously; one of the earlier hatchback models with the chain-driven 2.2 Tid engine. It was both reliable and reasonably economical. I sold it earlier this year at 205,000 miles, and with hindsight now wish that I hadn't. I like the look of the 180PS TTiD, and they are now quite affordable. Any pitfalls I should be aware of? A huge, deep crater. Lots of problems with this GM/FIAT/Alfa 1.9 diesel engine: /carbycar/saab/9-3-2002/?section=good/ and /carbycar/saab/9-3-2007/?section=good/ Get a 2.2 SAAB engined petrol model. I understand that the speedometer in cars can legally have an error range of +/- 10% with the speedometer on some cars more accurate than others. For example in my LEAF it is widely known that this has the full error range of 10% so whilst it shows 70mph you are actually traveling far lower than this. The only true way to measure your speed is via a satnav and use GPS tracking. HGVs however are known to have very accurate speedometers due to their speed limiters and their legal capped top speed. So my questions are A why the level of accuracy found I'm HGVs cannot be used in cars; B how can car owners travel safely if they cannot trust the speed information indicate on the speedometer; C I assume that if you were caught speeding, using the inaccuracy of the speedometer as a defence is not valid. Not that I condone speeding in any way or form. Just amazes me that with all the increases in technology we cannot have accurate speedometers. Speedometers are allowed to over-read. But they are not allowed to under-read at all. So manufactures set them to over-read typically by about 4% that can increase to about 6% as the tyres wear down. As you write, some manufacturers set them to over-read by more than that so the car appears to cover more miles on less fuel than it really does. Some cars now have satnavs incorporating a GPS speedo. But anyone can upload a free smartphone app that shows their true speed. If you compare that to 70mph on the speedo you instantly know how much your speedo is over-reading. Mine over-reads 3mph at 70, so I set the cruise to 72 and I know I'll never be over the limit even in Bedfordshire where you can get done for a true 2mph over. As you know, the amount of traffic and law enforcement patrols on the road has decreased due to budget cuts. However, the number of vehicles on the road which have MOT failing defects are seemingly on the rise. I constantly see: cars with only one head light working; cars with incorrect brake lights, e.g. one or more brake lights not working; cars that only have the high level brake light working. Who is responsible to report these vehicles and more importantly to whom? There are so many unsafe cars on the road that safely is being compromised. Thoughts? If any of these cars venture into Surrey and get spotted by the liveried or undercover traffic police, the drivers will get done and their vehicle checked for any other transgressions. If you follow Surreyroadcops on Twitter you will be suitable reassured. Hants traffic police are similarly vigilant. A more serious problem is the number of cars with Xenon lights and automatic load height adjustment that has failed, leading to considerable dazzle especially on motorways. My daughter-in-law is looking for a second-hand automatic car. As she is under 5-feet tall, she is looking for a small car which has an adjustable driver's seat that will raise her enough to see over the bonnet while still being able to reach the pedals. The steering wheel will need to be adjustable as well. Do you have any suggestions? My ex-wife is 4' 11" and had no trouble driving a Toyota Yaris based Vios auto that was the same inside as a Mk 1 UK Yaris. Now you can get Mk 1 Yaris 1.3 autos 1999-2005 from £1,000 to £2,500. The next Yaris MMT from 2005 had a poor automated manual. More recent small autos include the Hyundai i10, KIA Picanto, Suzuki Splash and Vauxhall Agila. Honda Jazz CVT-7s are very driver friendly. Also worth trying a Mazdas 2 1.5 auto and a Suzuki Baleno 1.0 BoosterJet 1.0 auto. All those mentioned apart from the Jazz and the Yaris MMT are proper torque converter autos. I'm looking to replace my 2013 Suzuki Swift 1.3 DDis with something more entertaining. I cover far fewer miles than when I bought this and I've got bored of it. During my browsing, I came across a 1980 Lancia Beta Spyder with 49k miles for £6,995. I've been told it's been stripped back and resprayed so should be rust-free. Would such a car handle being my daily driver - about 20 miles a day - without going wrong too often or breaking the bank with ongoing maintenance. Or should I look at more modern alternatives - Honda S2000 etc? As an everyday car through the winter I think you need something younger than 26 years old. Even if you suffer no mechanical problems, winter road salt will find every weakness in the car's body. A Honda S2000 isn't a great combination for winter either. If you want reasonably modern fun you can probably get a FIAT 500 TwinAir for £6,995. To date, I have had my 4 children as named drivers on my Insurance Policy. This has been very convenient for us all during their UK visits. But two of them now work and live most of the year in Sri Lanka, thus meaning they are no longer UK residents. They both have UK licences and return to the UK 2 or 3 times a year for short holidays. My Insurance Broker has recently told me that as non-UK residents they can no longer remain legally named drivers on my Policy so I've had to remove them. I can add them again on a temporary basis for £44 per week. Is all the above correct please and is it the same with all Insurers? Because of the stupid way UK insurers behave compared ton the rest of the world that is actually quite a good deal. It may be a stupid question, but why does my car have a button for turning the TCS off, and what happens when I press it? My car is a 9-year old SEAT Leon, front wheel drive, with about 100PS. The answer is don't ever turn it off unless you get stuck in snow when turning it off may actually help by allowing wheels with no traction to spin. You cannot legally 'borrow' your friend's trade plates, but he could drive the car to the p/x dealers on his trade licence and insurance on the basis that he is buying the car from you. Or it could be trailered there. Do not take the risk of driving it without Insurance and VED because if you get caught it's at least 6 point on your licence, the car will probably be confiscated and you'll still face a stiff fine.